…and what exactly do you mean by “UI”? This is a modified version of an internally-facing post (heavily referencing Erik Flowers’ article), which aimed to develop a common language between two groups of people. These two groups of people are not so different from each other, but words are funny and can only convey so much meaning by themselves in a given context. People bring their own meaning to the table. The process of writing it down helped me better understand the problem, and as a result better at explaining my take on what UX is, what a UX designer does, and what value it contributes to “the work” we do. (At the very least, it should foster a discussion that gets us closer). In doing so, it’s useful to first see what we (the Folk I work with) mean when we say “UI”. User interface design … is the crossover between visual design (look and feel) and the interaction design (how the look and feel work). Combine those two and you have an interface. The interface is the result of the “solution design” that came before it. The user interface is typically implemented (built) by a front-end developer (with CSS, JS, etc.). 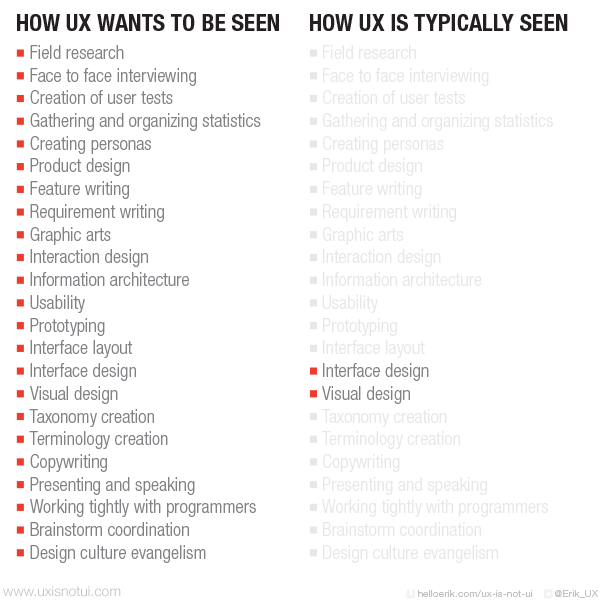 What do we mean by “UX”? ‘We just want it to look nice’. User Experience Designers don’t design things “in the same sense as a visual or interface designer”. (Can you actually “design” an experience?) UX works to identify and satisfy “the specific goals of well-defined users”, and how they interact with a system through a user interface. It’s not just the look and feel. 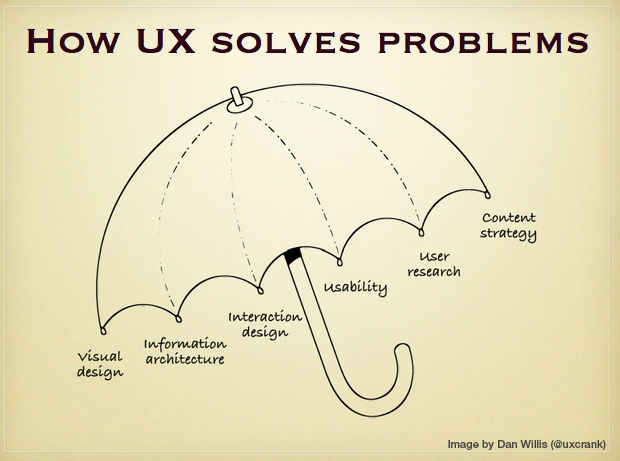 However, “doing” UX doesn’t require doing all these activities all the time. Some of these decomposed activities can be done by others (who may be more uniquely qualified), and some are not needed at all for a given problem. Not every UX practitioner is “full stack”. Who does the work depends on the people involved, e.g. user research specialists, interaction designers, web designers, developers, etc. The order in which these things are done depends on the type of project/engagement, e.g. linear, lean UX, variations on the above, etc. How successful the work is depends on many things too numerous and detailed to cover here, needless to say communication plays a big part.